I grew up outside of Philadelphia (so yes – Fly Eagles Fly)! I’m not going to disclose my age and will hereafter refer to this time as “back in the day”. So, back in the day, there was a famous restaurant near Head House Square called Bookbinders. Opened in 1893, It was originally referred to as an Oyster Saloon – which, by the way, is such a great name. One of the things that I remember about Bookbinders is that it was a magical place. When our family went there, we had oysters, lobsters, and seafood stuffed with crab meat. It was a special occasion place for many in the Philadelphia area. Another thing that stood out was their high-volume lunch business and table reservation system. Bookbinders was a weekly haunt for lots of businessmen. It was a place with impeccable white linen service and was a “go to” to impress a potential client or business relationship. 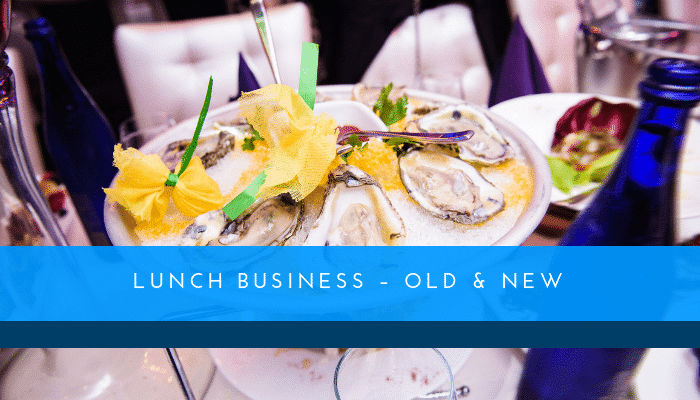 You could reserve a table for Friday lunch, the most popular day for business lunches, and keep that reservation on a recurring basis. The only catch was that you needed to physically be at the table every Friday or your reservation was gone. Like an exclusive club, the who’s who of the business world in Philadelphia could be seen entering Bookbinders every Friday. I started to think of my clients that are trying to build a sustainable lunch business without destroying their average lunch checks with discounts. It made me think about how and why Bookbinders was so successful at it. Certainly, times have changed, no two-hour martini lunches sadly, but the other components are still relevant. Familiarity with the guest and making them feel like they are walking into an exclusive club where everyone knows their name (a little nod to Cheers). It carries so much weight when you are greeted by your name at the front door of a nice restaurant and the servers recognize and acknowledge you. Of course, that means that you have to hire a greeter/host that can act as the center of your hospitality culture, which means you actually have to pay them an elevated wage. But think of the benefits of this investment in creating “sticky” guests that always choose your restaurant because of how they are treated. I think we have gone too far in assuming every lunch guest wants a quick, casual lunch experience and forget that there is still a lot of business entertaining going on during that meal period. If you are serious about building a lunch business in a full-service restaurant, I am going to state that the host position should be the highest paid employee on the floor and should be given the authority to take care of the guest. It would be so nice to walk into a restaurant and be greeted properly instead of looking at the top of the host’s head while they are playing around with their reservation system. Build a guest-forward lunch culture instead of a culture where the newest, most inexperienced hosts/servers are working the lunch shifts. ← Free Ride Home After Drinking?